St. Paul's owns two buildings. The church is located at 294 Main Street South and the Rectory at 317 Main Street South. 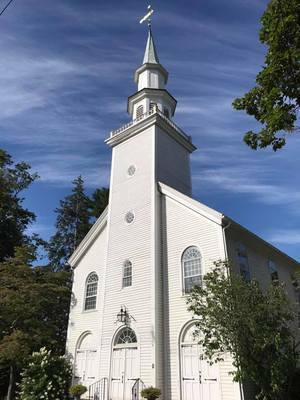 In 1784 the Woodbury Town Authority gave permission to the “Episcopal Society of Woodbury” to build a church. Although the church conducted its first service in November 1787, it was not consecrated until 1822. An 1854 renovation included a new altar and the installation of six tall panels with the two center panels declaring the Ten Commandments. Much of the earlier Victorian elements were removed during remodeling in the early 1940's. Thankfully, the Ten Commandment panels remain with only a change in background color from blue to black. Seven crystal chandeliers were added and continue to illuminate the church today. Also, a total of ten colorful stained glass windows adorn the walls. An expansion program in 1961 added the Parish House to the existing church building. The large main room in this addition is used for our gatherings. Other rooms in the Parish House include a classroom, a nursery, a kitchen, storage and accessible restrooms. The top floor of the Parish House provides administration offices, classrooms, a restroom and a three room apartment for our sexton. The lower level features a large room for parish and community meetings and dinners. This area includes a full kitchen and a restroom. It is the meeting place for our church sponsored Boy Scout Troop, as well as meetings held by such groups as AA and Al-Anon. Attached to the Parish House is a small white building, known as the Seabury Room. This room houses the church library and is often a meeting location. Diagonally across the street is our Rectory, an 1837 Greek Revival home. The first floor has a dining room, living room, study, large kitchen with eating area and bathroom. On the second floor are four bedrooms and a bathroom. The rectory is conveniently located within walking distance to the library, town offices, grocery store, post office, community theater and senior center. At the end of the driveway is a two car garage with ample storage space and a loft. When this home is not needed as a rector's residence, it has been a rental property.